Queen Victoria receiving the news of her accession to the throne at Buckingham Palace on June 20, 1837, from a painting of 1887 by Henry Tanworth Wells, RA (1828-1903). Source: Benson and Esher, frontispiece. The painting itself was later presented to Edward VII by the artist's daughters, and is in the Royal Collection. Such an introduction helps us to understand how the untried princess with her sheltered background, standing in the shaft of light with which Wells has illuminated her in this painting, could take on the mantle of Queen (and later Empress of India) and at the same time interest herself in the ordinary lives of her subjects. Benson, A. C. and Viscount Esher, eds. The Letters of Queen Victoria: A Selection from Her Majesty's Correspondence between the Years 1837 and 1861. Vol. 1. 3 vols. London: John Murray, 1908. Internet Archive. Copy contributed by the University of California. Web. 20 June 2017. 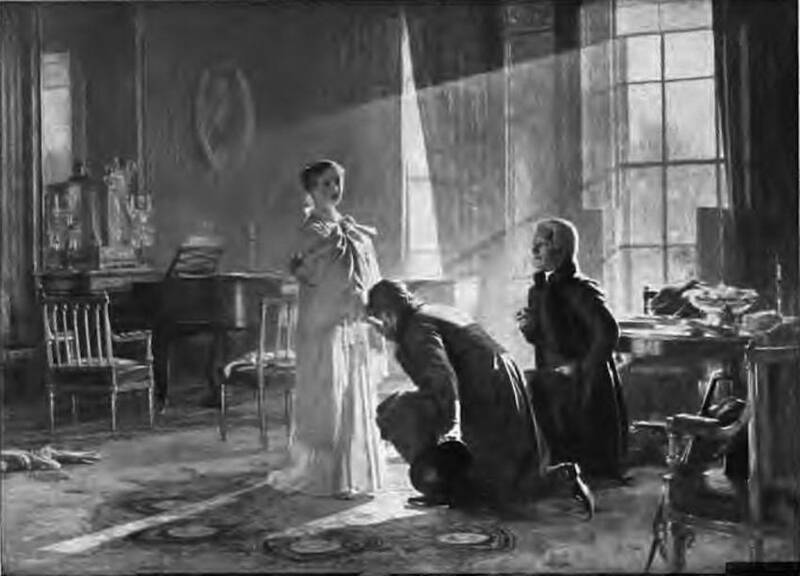 Victoria Regina: Queen Victoria receiving the news of her accession. Royal Collection Trust. Web. 20 June 2017.